Ethnic minorities have very little to thank Norman Tebbit for. Actually, come to think of it, there is nothing to thank Norman Tebbit for if you are an anti-Thatcherite but that’s another matter. Tebbit’s stupid ‘Cricket Test’ has done nothing but raise suspicion as to my loyalties and countless other ethnic minorities who really do support England on the sporting field. 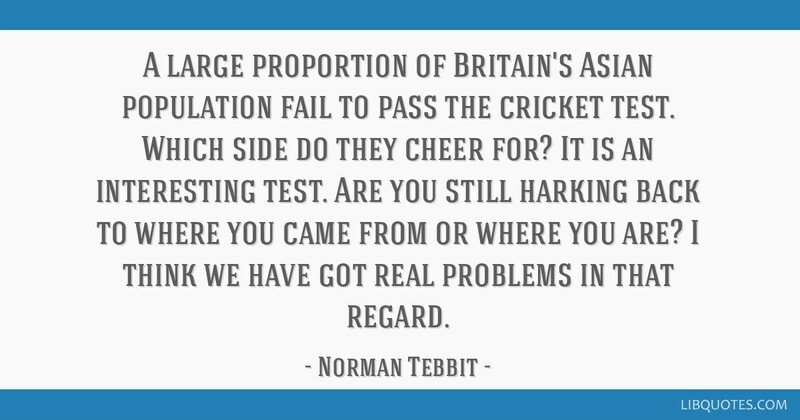 Norman Tebbit came up with his subjective test in 1990 in relation to Cricket as a way of rooting out Nationalist loyalties from the non-adherents. It has stood the test of time for the way it has stuck in people’s minds and seems to be gathering momentum in the minefield of a Brexit created anti-immigrant environment. More alarmingly, not only has it stood the test of time but it has been extrapolated to other sporting agendas too. I am constantly being asked which team I am supporting in the World Cup. My immediate answer is ‘England’ which, oddly, seems to elicit disappointment within the English person asking the question. A second question then ensues as if on cue and it is along the lines of, ‘No, really, who are you supporting?‘ The same answer from me provokes a wholesale disbelief, again, and the questioner goes off DISAPPOINTED. Uncovering the disloyal ethnic minority has become a peripheral enquiry in work places and in social settings alongside the central frenzy on whether the World Cup is ‘…Coming Home’. The perceived disloyalty is purely based on colour. I know a Scots man who doesn’t want the Cup to ‘come home’ but, being white, he is never asked about his loyalties. I shall be watching the game today with a 99 year old English woman who has an OBE. She is laying out a cream tea treat for us. You don’t get more English than that. By the way, I support England in international cricket matches too even though I don’t have any interest in cricket.